During September and October, students of Austin School of Film and HIVE Arts Collective shot, hand-processed, telecined, and edited their own Super 8mm films. I was inspired to make my first zombie film, starring my good friend Rachael, my partner Victor, my dad, and my toddler daughter, as well as about 15 awesome local Pflugerville residents who came out and gave it their all as our horde of zombies. The result, a film called “Zombie Daze,” premieres online for the first time today! It premiered at the Austin School of Film Friday night to a fun, enthusiastic crowd. And happy October and Halloween! We don’t always blog for the grooms who might visit our blog, so we wanted to write a quick post about a cool event we got to go to last week. Michael enjoys fly fishing, so when our friend invited us to the Austin stop of the Fly Fishing Film Tour last Thursday at the Paramount, we had to check it out. Living Waters Fly Fishing – Offers classes like fly tying every Wednesday night and a guide service for the Llano, San Gabriel, Guadalupe, and Brushy Creek rivers. Orvis Fly Fishing Classes and Sporting Adventures – Classes, trips, and more, like “Austin City Limits on the Fly” and even a Scotch tasting! The films that the tour featured were full of beautiful cinematography and locales and lots of fishing action–enough to satisfy any serious fisherman or filmmaker. For more fishing videos and info on the tour, check out Orvis’ blog post film wrap-up or the Fly Fishing Film Tour Vimeo Channel. We were lucky enough to get tickets a couple of weeks ago to American: The Bill Hicks Story screening put on by the Austin Film Society. When I got them, I didn’t realize the filmmakers Paul Thomas and Matt Harlock would be in attendance for a Q&A afterward. As a special treat, Bill Hicks’ mother and brother were able to join in the conversation over Skype, which compounded the emotional impact the film had. The film debuted at SXSW, and although it’s been released in Europe for a little while, it’s just now debuting in the U.S. It opens in Austin at the Alamo Drafthouse South Lamar this Friday, and we both highly recommend going to see it whether you’re a fan of documentary films or the comedian. The filmmakers gained the trust of the Hicks’ family, and captured a more intimate portrayal of Bill Hicks’ life that anything about him has been able to so far. Weaving together childhood film and photos, stories from his best friends, and family, they’ve created an enlightening glimpse into the life of the inspiring and provocative comic whose life was cut much too short. Using Aftereffects and Photoshop, they’ve created rich animations to illustrate his life. 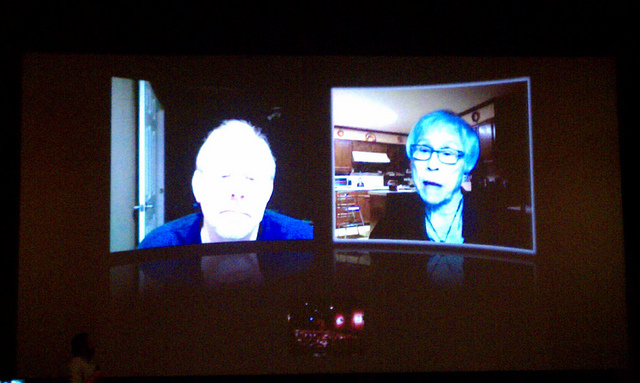 Bill Hicks' Family via Skype at Austin Sneak Peak of "American"